June, Thank you for this well researched piece about an artist about whom I have very little knowledge; for sharing notes on the exhibit you and Terry were able to see in San Francisco. My interest in learning more about David Hockney is keen and three books have been requested from my public library so that I can spend some visual time with his work as well as learn more about him as an artist. Your three part article on your blog was written in a way that pulled me to feeling as though I was there with you as you spent time with his work. Much appreciation for this story about David Hockney from your personal experience with his work. This has opened a new door of exploration for me. Whenever your voice sings out on Ragged Cloth Café I am invited to make a cuppa and sit and read and learn from your writing, your perspective and understanding of the topic you cover. Perhaps we will again be visited here in the Café by the one who began this grand platform for writing, sharing and learning. As I say, I certainly admire Hockney’s approach to art (drawing), but do not agree with his condemnation of the more widespread use of the camera. There is a legitimacy in purely capturing a frozen moment, as do the best, such as Henri Cartier Bresson. Also, there is validity in the work of those who make art from their imagination, having put their looking through the machine of their mind before transmission through whatever tool to their fingers. In both these cases, looking is equally essential as a starting point – indeed I do believe that the more, the better one looks, the more likely the outcome will have merit. Looking and seeing in real time, coming closer to reality, does not mean that one has to reproduce that reality as one saw it then. One could say that it takes an artist not only to see clearly, but to process that vision to produce something perhaps otherwise unseen or even unseeable to the viewer. 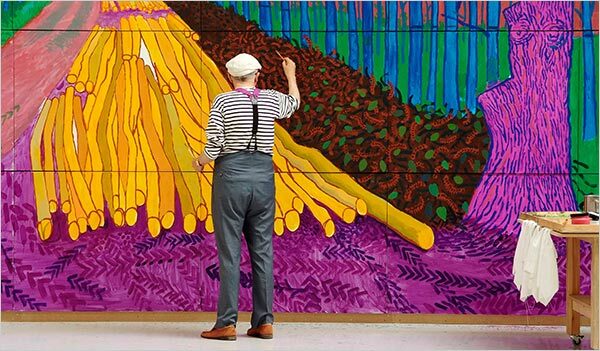 But Hockney is indeed a giant of an artist: for the fluency both of his work, his excited curious seeking eye and mind, and of his description and explanation of his approach and explorations. Hi Olga, good points to make. 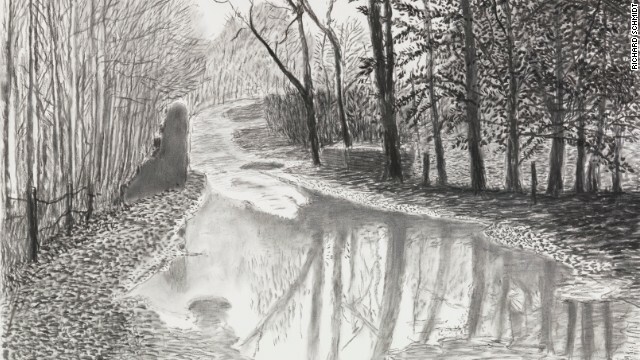 And in Hockney’s favor, he’s pulled back on his 80s rhetoric about the evil camera — he actually says it has done wonderful things (and he points to Bresson and publishes “Picnic on the Banks of the Marne”, 1938 as proof). And he works from imagination as well, although it’s after looking — in fact, I think at least one of the biggest, and most highly stylized, paintings at San Francisco was clearly a “memory” painting. I suspect what his next intellectualizing will be an enlarged art theory of “time”, “over time” and “context” — and clearly these latest works are, as he says, about time. I started this riff thinking about my own drawing, which you may remember I am neurotic about — always feeling inadequate. But I’ve also gotten rather tired of the repetitious nature of many landscape paintings and figure drawings. In the former, not looking “for real” seems to result in banality (to put it in really black terms, the “painter of light” stopped looking long before he couldn’t see any more). However, a more serious critique of Hockney would be that since “seeing” is a mediated sensation — that is, your brain has to tell you that you are seeing something that means something, then isn’t the camera a decent mediator, giving meaning, particularly as H. admits to its capturing something like 98%. I think his real point is that he’s looking again and seeing with a different mediator (although I’m not sure what that is — whatever it is, I see like that too). The second point, about figure drawings is not that people who are in figure drawing classes and workshops and studio sessions aren’t looking. indeed, in my experience, they are looking and looking and looking and looking again. But they seem to think that that is sufficient. They seldom put their figures into any context whatsoever — all undistinguished background with a bit of lights and darks to highlight the figure. Those drawings all look the same to me, and they can neglect meaning and even pointed gesture. Your contours with their “tells” of attitudes and companions, etc. tell us a thousand percent more than the most detailed 10 hour figure drawing in charcoal will, particularly if the figure is that and only that. Your point about Hockney’s exciting eye and mind and his description and explanation of what he’s about is indeed what has always excited me. I didn’t even much like his art until I saw this 21st century English landscape work; but I found his mind so rich that even in the 1980s I didn’t care. And of course, that is heresy among visual artists. I guess I’d say H’s. work is truly “conceptual” art, however the academics define and illustrate the mode. And in addition, it’s highly visual, unlike a lot of conceptual pieces. I wonder if all who seriously attempt artistic expression feel inadequate about their product? Perhaps we should all accept that like Hockney says all attempts are researches: explorations not only about how things look but also about how we feel about what we are seeing. In any case what we see when we look can only be approximated in what we express, whether visually or verbally – or in music. Maybe we should not try to declare our work to be expressions of what we see, but expressions prompted by what we see and how we feel about that – whether as a Cyclops, or somehow over time. I found it fascinating to learn that when Hockney first went to California and encountered the many swimming pools that he spent a great many hours looking at the water in the pools before he started to capture what he saw in the water. (I read this in the Christopher Simon Sykes biography: A Rake’s Progress, which I very much enjoyed.) This fits in with his preference for drawing folks he knows well rather than random strangers, and his love of returning to the same places to see how they have changed. Yesterday I was watching a film by Studio International about the landscape artist Kurt Jackson (it is on the News page of his website http://www.kurtjackson.com/News-Page.html ), and was interested to hear that he much prefers to paint places he knows rather than be like a tourist snapping a view. As I grow more accustomed to my own body of work and how I am preferring to develop, I agree with the need for familiarity – at least as a kind of filter either of input or of output, if not both. I so agree with what you say about the life class experience. I signed up for a term, and am finding it frustrating. I get bored so quickly! It is a positive reaction for me, however, because it confirms that what I’m doing is what I want to do. Indeed I had a fascinating chat with one model this week – his experience over many years of both artist himself and model reinforced my instinctive response to the situation in relation to my work. I must return to Rodin to look hard once more at what he did – both in drawing as well as sculpture, and why I love it. Snap also about loving the mind but not going much for the work. This is not the case with Hockney as far as I am concerned, but I am hardly ever opposed to hearing or reading what an artist thinks, feels, wants to do, etc. even if I dislike the work. Besides, one does not always have to agree with what has stimulated thought!